Proud tradition: Troy Bailey (left) takes over the running of Rosies from outgoing general manager Bob Boardman. ROSIES is experiencing a mix of familiar and new as it gears up for its annual presence at Schoolies Week on the Gold Coast and a change of leadership takes place. 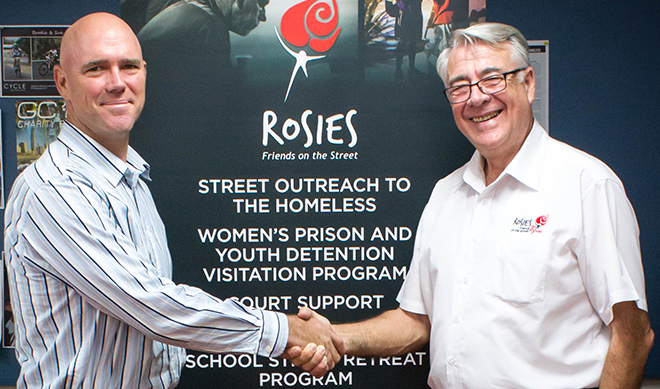 New general manager Troy Bailey, a self-described “passionate Rosies volunteer”, will be working alongside other volunteers at Schoolies Week which started on November 16. The 47-year-old successful operator of hotels and other businesses, married with two children, has taken over from Bob Boardman who was Rosies general manager for more than five years. Mr Bailey said he was determined to build on his predecessor’s “outstanding work”. “Bob’s hard work, passion and dedication have been much appreciated by everyone in the Rosies community,” he said. Rosies’ Schoolies Week co-ordinator Cat Milton said the presence of the new general manager at Schoolies Week would be “a huge boost”. “It will mean so much to have him leaping in beside us with his sleeves rolled up,” she said. Rosies, having started involvement with Schoolies Week in 1987, is the longest-serving volunteer organisation at the event. The ministry was an offshoot of Rosies – Friends on the Streets, an initiative of the Missionary Oblates of Mary Immaculate. Ms Milton said setting up of Schoolies Week infrastructure, including a fenced-off hub, was to take place from November 15. There will be 30 volunteers from Rosies alone with 11 government departments and services and eight non-government organisations involved. Ms Milton said the numbers attending – 35 to 40,000 young people – were expected to be much the same as the previous year. However, each year the “bar is being raised” in terms of support for the young people taking part in the end-of-school celebrations, she said. “We’ve made a particular effort to have targeted recruitment to ensure sufficiently qualified volunteers work alongside young people at risk,” Ms Milton said. “Volunteers have been sought with qualifications in youth work, counselling or with significant experience in the field.